Sergi Skripal: Who Done It? The official explanation as to how they were poisoned, is that it was in Yulia's luggage when she flew in from Moscow the previous day, it then miraculously got out of her luggage, and at the exact same time it poisoned her and Sergie, presumably it was at the exact same time, as the affects kicked in at the exact same time, and conveniently the affects occurred as they were both passing a park bench, so they had time to sit down rather than just fall down somewhere! 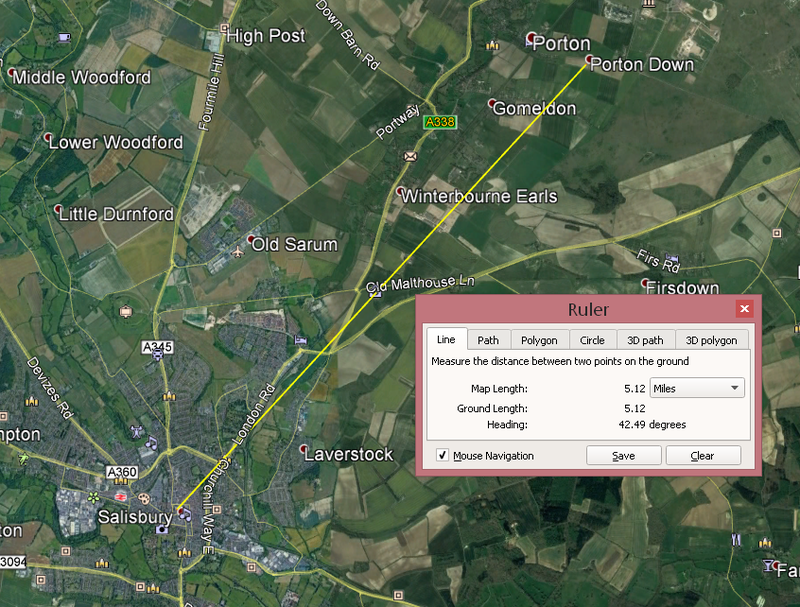 Porton Down is a United Kingdom Science Park situated just northeast of the village of Porton near Salisbury, in Wiltshire, England. It is home to two UK Government facilities: a site of the Ministry of Defence's Defence Science and Technology Laboratory (Dstl) – known for over 100 years as one of the UK's most secretive and controversial military research facilities, occupying 7,000 acres (2,800 ha) and a site of Public Health England , it is also home to other private and commercial science organisations, and is expanding to attract other companies. The site is commonly confused with the nearby chemical-biological-radiological-nuclear (CBRN) training facility, the Defence CBRN Centre at Winterbourne Gunner. 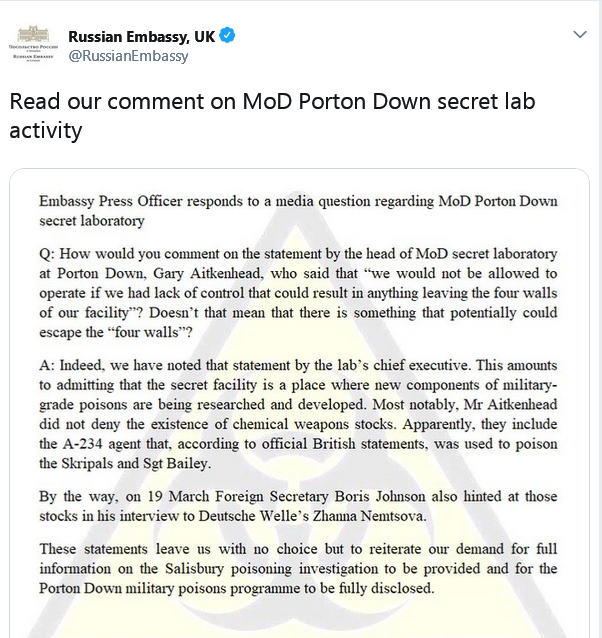 Above is a Tweet from the Russian Embassy , and they believe the offending nerve agent was manufactured a good bit closer to the scene of the crime, Porton Down is just over 5 miles from Salisbury. 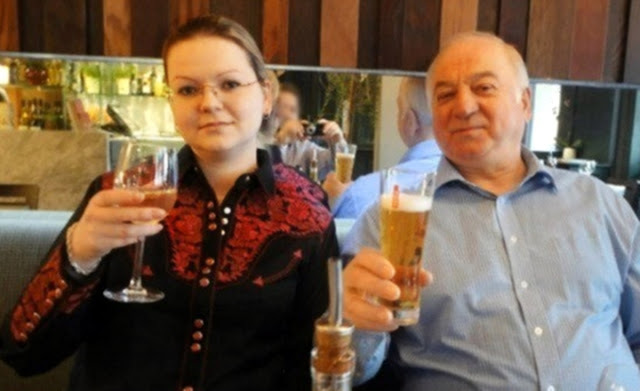 Sergie Skripal was a highly trained Russian Agent, in 1995 he was recruited by MI6 in Spain, his code name was "Forthwith". During his time feeding them info he revealed the identities of 300 undercover Russian agents. He rose to the rank of Colonel before the Russians caught onto him in 2004, he was given a 13 year sentence for espionage and treason. Various news reports have described him as a highly valued, and HIGHLY PAID MI6 agent. In 2010, British Intelligence services appealed to the Russians to release him, and he was released under a spy-swop program. He arrived in Britain in 2011 and immediately became a home owner in Salisbury, it is not on the record where he came by the money to buy a house, he later became a UK Citizen, he drove a top of the range BMW, and no reports mention how he survived financially in the UK. So! The Russians had him under lock and key for 6 years, he had diabetes, so at any time during his incarceration they could have bumped him off and made it look like a natural death, they did not, they released him to the British. Between 2004 when he was accused of being a double agent, and 2010 when the Russians handed him over to the British, the Russians treated him well and made no attempts on his life. Now who would want him dead? He betrayed the Russians and gave MI6 all the information that he had access to, but they could of killed him at any time while he was in Russia, they did not, so what secrets did he not reveal? He did not reveal the identities of his MI6 handlers, and living in Northern Ireland I know only too well how MI5 & MI6 dispose of their "assets" when they are finished with them, dead men don't talk! Of course if MI6 done it, they would have to make it look like someone else done it, they could of had him suicided, or some other means that would of made it look like a natural death, but they chose not to, Sergi only had one family member left, his brother, wife and son were already dead, there was just him and his daughter left, what if he had revealed details to her about his work with MI6? it would seem she had to go as well, and the UK establishment do like to keep the Cold War on the back boiler, so they literally killed two birds with the one stone. Informer who has outlived his usefulness gone, and Russia public enemy number one again, the whole thing is being played out like a pantomime! One of the pieces I read today mentioned that a Russian diplomat had commented that if they had wanted him dead, then he would be dead, Sergei and Yulia are of course still alive, albeit in a very critical condition. 15.35 they departed Zizzi restaurant. 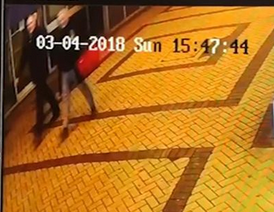 15.47 they were captured walking through a Shopping Mall. 16.15 found on Park bench. Sergi and Yulia caught on CCTV 28 minutes before being found on park bench unconscious. 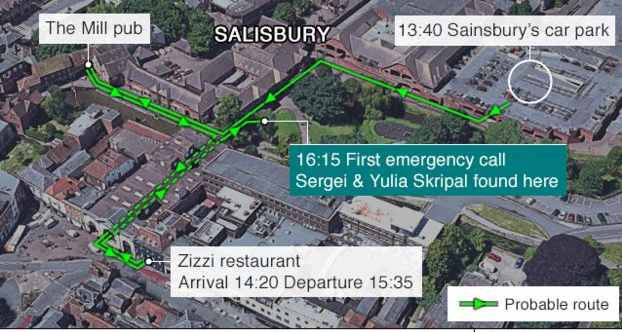 The CCTV pic was taken at 15.47, 28 minutes later at 16.15 they were slumped on the park bench, like exactly how long does it take for Novichok to take affect? Traces of it have apparently been found in Sergei's home and all the places they visited, so how long between poisoning and them becoming unconscious? Is it not somewhat unusual that they both seemed perfectly well and able, then bang they both succumb to the affects of the poisoning at exactly the same time? Furthermore, I find something very odd about the CCTV pics, they appear to both look at the camera at the same time and then smile! Almost like they wanted to be sure full face images were captured? The country is full of CCTV cameras, who looks at them and then smiles? And what are the chances of two people walking together seeing a camera at the same time, then both looking directly at it and smiling? Is it possible that the whole thing is a charade to get a good old row going between Russia and the UK? As I said previously, they do like to keep the cold war on the back boiler, the parasites feed of fear, so they create it at every opportunity, and a fearful populace is easier to control, and less rational. Having said that, most people seem to be treating this entire episode as a joke given the whole thing is so ludicrous! Also worth mentioning, the Russians and US have developed electromagnetic weapons that can cause heart attacks, and the victim appears to have died by natural means, which begs the question, when this sort of technology is available, what agenda exactly is being played out when they are supposedly attacked with with a nerve agent used by Russia decades ago? "remote control heart attacks"
I have also been looking at the numerology and esoteric importance of the area the whole thing unfolded, but that's for another blog. The Mill pub where they had a drink before lunch! 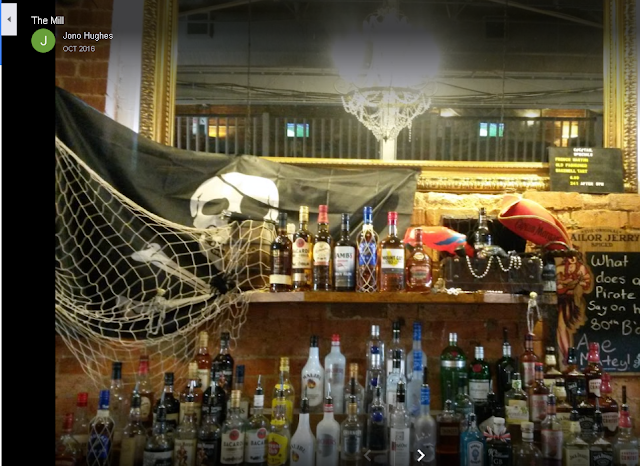 Good old Skull & Bones behind the bar! 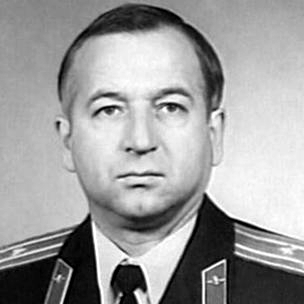 Sergi in his Russian uniform, he betrayed his country and he betrayed over 300 of his work colleges, clearly he had not demonstrated that he was a trustworthy person, he was useful to MI6, but at 66 years old, and no longer having access to Russian secrets had he outlived his usefulness? The Haiti Earthquake was on January 12, 2010, as we approach the 8 year anniversary I thought I would read up on progress since the earthquake. There is great speculation that this was no natural disaster, that it was very much man made, but I will not be delving into that in this blog. By this stage it is also well documented who got rich from the disaster, namely the Clintons, who collected millions of dollars for the relief effort, the said millions never made their way to Haiti, but I won't be delving into that either. "Now, according to recent reports, a round of exploratory drilling by Canadian and U.S. companies has unearthed valuable metals. These include gold, silver and copper, which may be worth close $20 billion, and is viewed by many as a potential economic boon for this nation." So, who exactly will be profiting from the supposed $20 billion worth of precious metals? "Extracting minerals in Haiti has been prohibitive in the past due to many issues, including political instability and resistance to mining companies. But the price of gold has held steady above $1,500 an ounce for the past year and Haiti hosts a U.N. peacekeeping force of 10,000 that will assure some security for the companies – both of which make exploration in Haiti appealing once again". "According to its mandate from the UN Security Council, MINUSTAH is required to concentrate the use of its resources, including civilian police, on increasing security and protection during the electoral period and to assist with the restoration and maintenance of the rule of law, public safety and public order in Haiti. MINUSTAH was established by United Nations Security Council Resolution 1542 on 30 April 2004 because the Security Council deemed the situation in Haiti to be a threat to international peace and security in the region. 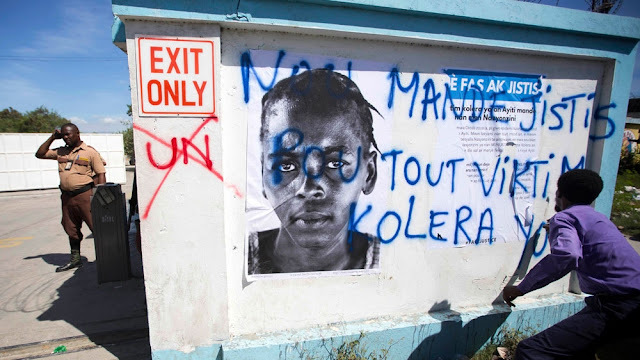 In 2004, UN peacekeepers entered Cite Soleil in an attempt to gain control of the area and end the anarchy"
"In 2004, independent human rights organizations accused the Haitian National Police (HNP) and sometimes MINUSTAH of atrocities against civilians. It is still argued if any, or how many civilians were killed as a by-product of MINUSTAH crackdowns on criminals operating from slums. The UN and MINUSTAH expressed deep regret for any loss of life during operations. By the time of the earthquake on January 12, 2010, the UN's mandate to be in Haiti was about to run out, however it was extended to 2012 because of the earth quake, The UN then voted to keep them there until the present, and this year the mandate will come to an end, but it will be replaced by a new mandate, and no doubt protecting the mineral reserves on behalf of the corporations will be part of the new mandate. So, since 2004 the UN have had a force in Haiti, which just happens to be a neighbor of Cuba, how convenient for the US that UN troops occupy a country that neighbors their enemy Cuba! And how convenient that the 2010 earth quake pretty much gave them a no end date occupation of that country! Also, recent reports about the plans to mine in Haiti would suggest that it was only recently discovered that the country had billions worth of gold and silver, this has been known from the 1970's, and it was the UN Development Program that discovered in in the 70's. So, after testing in the 70's, 80's and 90's, the UN has an army stationed there by 1994! Over 300,000 people died in the earthquake, to put that in perspective the population of Haiti is 10 million, the population of Ireland is almost 7 million. "For the first time since a cholera epidemic believed to be imported by United Nations peacekeepers began killing thousands of Haitians nearly six years ago, the office of Secretary General Ban Ki-moon has acknowledged that the United Nations played a role in the initial outbreak and that a “significant new set of U.N. actions” will be needed to respond to the crisis. The source of the waterborne disease, which killed more than 9,000 people, was traced to a UN base. The stated purpose of the UN troops in Haiti at that time was to help people, but now it would seem that they were hard at work finishing of survivors! Despite there being no doubt that the outbreak came from a UN base, the UN are not liable, your cannot sue them for damages, they have total impunity, the law does not apply to them! So why the all out assault on Haitians? Could it be anything to do with Haiti being right beside Cuba? 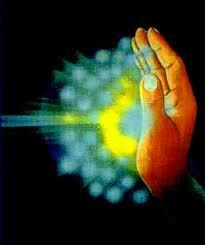 Remember the mining is to be in the North of Haiti which is the where Haiti s closest to Cuba. As far as I can gather, mining in Haiti has not yet began, and this is thanks to the efforts of Haitian environmentalists. In 1492 about 90% of Haiti was covered in trees, currently under 2% of the country now has trees, this has left their already fragile environment in a precarious position, and experts are concerned about the water being contaminated among other things. Extracting the precious metals could leave the North of Haiti a barren waste land, probably perfect for a big military base, but no so perfect for human habitation. 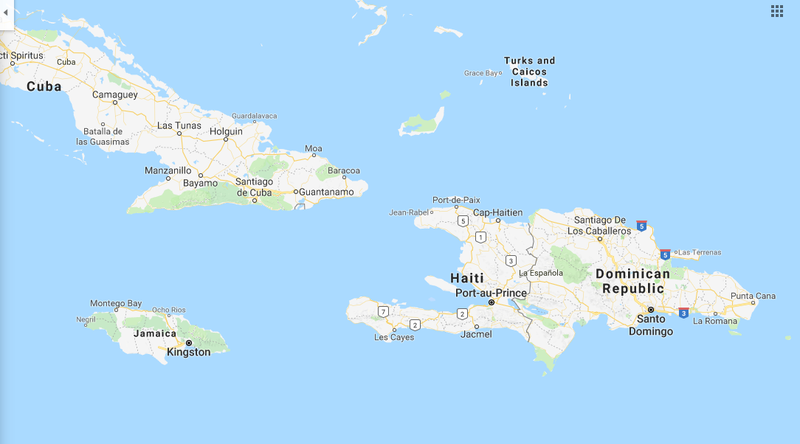 In this short blog I have only scraped the surface as to what is really going on in Haiti, for over a decade now there appears to have been an all out assault on the people of that land, and given its location and vast resources, I am afraid I can only see further depopulation exercises in Haiti, no doubt the UN will be assisting further in that exercise!